In about 6 and a half years with Android Phones, there has been only one app which I always turn to for playing music, Poweramp. Sure the GUI is dated, and it has some minor navigation issues compared to the more polished interfaces which most music player apps now boast. The sound quality and the volume boost that the app offers is unmatched by the audio engines of any other app, and to test this I literally bought most music player apps over the years, only to return to Poweramp. 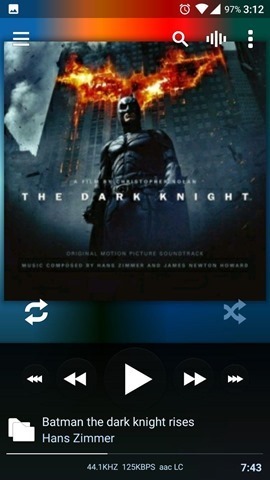 I am sure there are many who would like to see Poweramp given a proper overhaul, and that is about to happen. According to Andre, over at the Poweramp forums, the developer of the music app, Max, is about to release Poweramp version 3 soon. This new version will have a proper material design, it’s about time, right? Apparently this version was written from scratch, code-wise, and this work took a year to finish. While there is no screenshot of the new UI, there are a few details which do intrigue us. 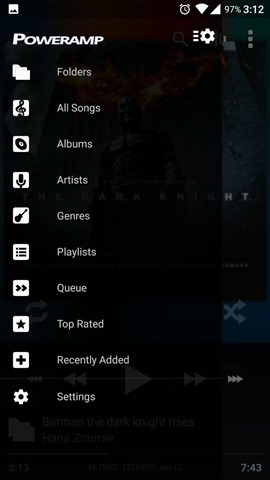 Poweramp version 3 will drop slide-in menus (seen above), and will now rely on buttons and gestures for navigating the GUI. Speaking of which the skin is changed from dark to White, to keep with the Material design guidelines we presume. Visualizations will be rendered on a black background. There will be new album art effects too. Audio-quality eise, nothing will be changed as the post does mention that the same alpha-test audio engine will be in place. Third party skins will need to be redesigned for the new UI. Now, for some partially bad news. With version 3, Poweramp will drop support for devices running on OS versions below Android 5.0 Lollipop. But you can continue to use Poweramp v2 if you are on an OS between Android 2.3 Gingerbread ot Android 4.4 KitKat. And now for some great news, the next version of the app, i.e.,Poweramp version 4 will apparently include some impressive features, such as DLNA/Chromecast output, tablet GUI, more options for the DSP and Equalizer bands (5-8-10-16-24-32). There is no concrete release date for the open beta test for Poweramp version 3, but an ETA has been given which suggests that it will be released by the end of March or April.